Congratulations to Barone Middle School wrestlers who “did us proud” last week at the middle school state tournament. Today is “Sorry, Charlie” day, honoring those who have been rejected and lived through it. April 9 is “Name Yourself” day. If you could have chosen your name, what would you have named yourself? Happy Easter weekend, everyone! May you find all the hidden eggs and baskets, and enjoy your church service, too. Don’t miss the presentation of the stations of the cross on the courthouse square this weekend. Anyone think it’s a coincidence that April is National Anxiety Month and the month we all have to file our income taxes? Probably not. Happy birthday today to Mikayla Brink. Also celebrating a birthday this week are David Buckles, JH Sheridan and Shelbi Blazon, April 6; Helen Ruth Oliver and Karen Doll, April 7; Joe Newman, Laurette Sikes and Bev Shaw, April 8; Ann Marie Scritchfield, April 9; Paul Neilson, April 10. Happy anniversary to Pat and Niki Turner, April 8. Longing for more daylight? This is your weekend. Don’t forget to “spring forward” your clocks one hour on Saturday night as we return to Daylight Savings Time. Clem Clark lost his battle with cystic fibrosis about 3 a.m. Monday at Pioneers Medical Center in Meeker. 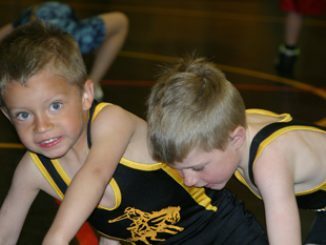 MEEKER I More than 250 peewee wrestlers from the Western Slope and western Utah, competed in the Casey Turner Memorial tournament last Saturday in Meeker High School’s gymnasium.